Peter Crowder, left, with his mum Sue and father Bernard and his brother Charles. Never, for one moment, did Pete Crowder think he’d go into the family business. Especially not when he and his brother were sitting outside a pub, waiting in the car while his dad delivered a singing telegram. Pete explained: “We knew no different so I suppose for us it wasn’t unusual. For everyone else I’m sure it would have been. “We could often be found in the car waiting while dad delivered a telegram dressed as Tarzan or Rambo or a gorilla or some such thing. This most unusual of family businesses started in the early 1980s with Pete’s mum and dad Sue and Bernard Crowder. Pete, aged 30, said: “They met while working for an accountancy firm and mum wanted to find a way in which they could work together. From these humble beginnings the award-winning Charlie Crow costumes company was formed. 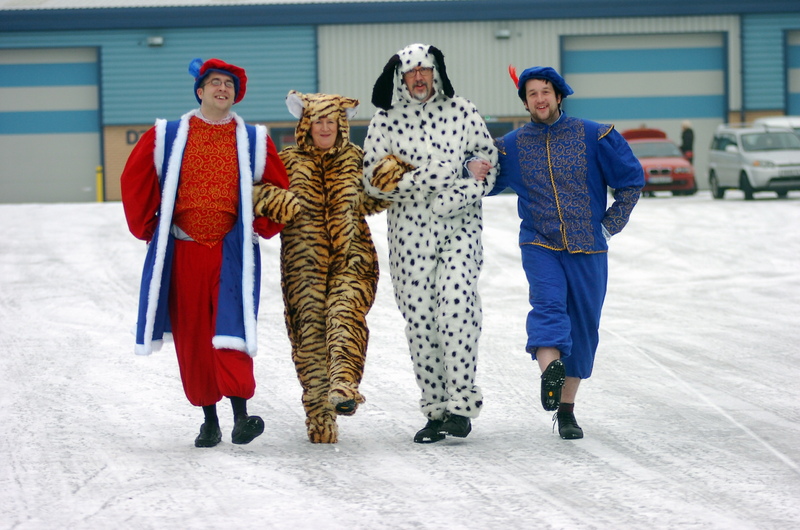 Established in 1985 and based in Fenton ever since, the firm began with Pete’s mum being asked to make fancy dress costumes for adults. He said: “Over the years the business has become very much focused on children’s costumes. “I have to say I never grew up expecting to work here but I found myself at a loose end after college, did a bit of work here, and found that I could design costumes like my mum. “I suppose living in the environment had an affect on me. I had a really fun childhood. There are pictures of me knocking about dressed as a dalmatian and trying on all sorts of costumes. To my brother and I that was the norm. Charlie Crow now employs 14 people and sells to schools as well as individuals all over the world. Its popular lines for children include animals (the dalmatian is still a favourite, apparently), dinosaurs, fairies, Halloween, king and queen and Victorian fancy dress costumes. Pete, who lives in Wetley Rocks with his wife Jade and their two young children Freyja and Leon, said: “We do obviously go through fads but some designs seem to be ever popular – like our ‘Ernest the Urchin’ which is similar to a sort of Dickensian Oliver Twist-type costume. “We get a lot of requests for king costumes around Christmas time and last year we had a lot of people wanting king and queen costumes around the time of the Queen’s Diamond Jubilee celebrations. “It’s nice when I see one of our costumes being used – it gives us all our real buzz. Pete agreed that dressing up for children was one of the simplest and most enjoyable forms of play which fires the imagination. He said: “Kids have always dressed up and always will. Parents can pick up, say, a witch’s costume in a supermarket for a few quid and the truth is ours cost a lot more than that.